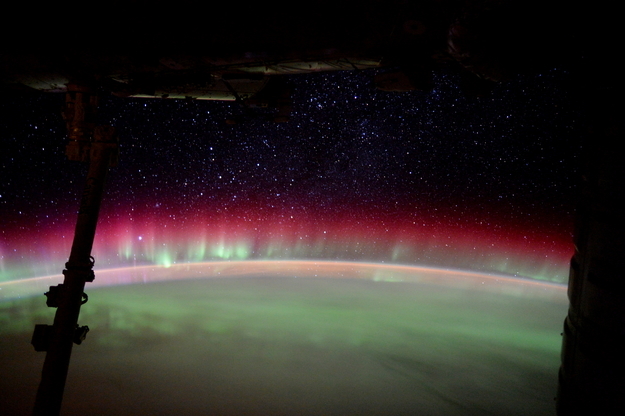 An image of aurora Australis, also known as the southern lights, taken from the International Space Station by ESA astronaut Tim Peake in June 2016. The colourful image shows a red band at high altitudes, most likely due to emission by electrons with energies around 100 eV, which are in the energy range of observed auroral emissions driven by Kinetic-Scale Field Line Resonances (KFLRs). However, a confirmation that these emissions were associated with KFLRs would require direct measurements of the electron distribution from a low earth orbiting spacecraft. Combining data from ESA's Cluster mission and NASA's Van Allen Probes, scientists have revealed how electrons in a similar energy range interact with KFLRs, a class of standing Alfvén waves which are enhanced during geomagnetic storms. This study helps explain the behaviour of particles within these waves and has significant implications for our understanding of space weather, which is in turn necessary to help protect space technology from the potentially harmful effects of energetic particles generated during such storms.